Recent studies have demonstrated the importance of TLR signaling in intestinal homeostasis. Celiac disease (CD) is an autoimmune enteropathy triggered in susceptible individuals by the ingestion of gliadin-containing grains. In this study, we sought to test the hypothesis that gliadin initiates this response by stimulating the innate immune response to increase intestinal permeability and by up-regulating macrophage proinflammatory gene expression and cytokine production. To this end, intestinal permeability and the release of zonulin (an endogenous mediator of gut permeability) in vitro, as well as proinflammatory gene expression and cytokine release by primary murine macrophage cultures, were measured. Gliadin and its peptide derivatives, 33-mer and p31-43, were found to be potent inducers of both a zonulin-dependent increase in intestinal permeability and macrophage proinflammatory gene expression and cytokine secretion. Gliadin-induced zonulin release, increased intestinal permeability, and cytokine production were dependent on myeloid differentiation factor 88 (MyD88), a key adapter molecule in the TLR/IL-1R signaling pathways, but were neither TLR2- nor TLR4-dependent. Our data support the following model for the innate immune response to gliadin in the initiation of CD. Gliadin interaction with the intestinal epithelium increases intestinal permeability through the MyD88-dependent release of zonulin that, in turn, enables paracellular translocation of gliadin and its subsequent interaction with macrophages within the intestinal submucosa. There, the interaction of gliadin with macrophages elicits a MyD88-dependent proinflammatory cytokine milieu that facilitates the interaction of T cells with APCs, leading ultimately to the Ag-specific adaptive immune response seen in patients with CD. Celiac disease (CD)3 is an autoimmune enteropathy triggered by the ingestion of gluten-containing grains in susceptible individuals (1). Both the gliadin and glutenin fractions of wheat gluten and similar alcohol-soluble proteins in other grains are the environmental stimuli responsible for the development of intestinal damage associated with CD (2, 3). The disease is associated with the HLA alleles DQA1*0501/DQB1*0201, and in the continued presence of gluten the disease is self-perpetuating (1). The typical intestinal damage in CD is characterized by the loss of absorptive villi and hyperplasia of the crypts that resolve upon the elimination of gluten-containing grains from the patient’s diet (2). It is now evident that CD is the end result of an inappropriate T cell-mediated immune response against ingested gluten (2). However, the earliest events leading to CD may involve the innate immune response. Under physiological circumstances, the intestinal epithelium, with its intact intercellular tight junctions (tjs), serves as the main barrier to the passage of macromolecules such as gluten (4). In healthy individuals, small but immunologically significant amounts of Ag cross the defensive epithelial barrier via one of two functional pathways. Most Ags are absorbed through the transcellular pathway, followed by lysosomal degradation that converts proteins into smaller peptides and/or constitutive amino acids. The remainder is transported in the form of intact proteins or their polypeptide by-products, resulting in Ag-specific immune responses in the submucosa. This latter phenomenon uses the paracellular pathway that involves a sophisticated regulation of intercellular tjs that leads, ultimately, to Ag presentation to the GALT. When the integrity of the tj system is compromised as it is in CD (5, 6), an inappropriate immune response to environmental Ags (i.e., gluten) may develop. The gliadin-induced release of zonulin, a recently described intestinal protein involved in tj regulation (7), seems to be responsible, in part, for the increased gut permeability that is characteristic of the early phase of CD (8). Zonulin was first described as a mammalian homologue of Vibrio cholerae-derived zonula occludens toxin (ZOT) (7, 9). Although zonulin has yet to be cloned, recent functional and biochemical characterizations strongly support the hypothesis that it is a preformed protease that is rapidly released into the luminal side of the intestine in response to gliadin or bacteria (10). Like ZOT, zonulin interacts with the intestinal epithelium to initiate a signaling pathway that results in phosphorylation of proteins within the zonula occludens and, in turn, a loss of intestinal tj integrity (11). Zonulin-mediated tj permeability may also be responsible for the increased incidence of other autoimmune disorders reported in untreated CD patients (8). The interaction of zonulin with intestinal epithelial cells is presumed to involve a cell surface receptor. Both ZOT and zonulin activities on tjs are blocked by an inactive peptide that is derived from the N terminus of the secreted fragment of ZOT (7, 9, 12). This same sequence also shares strong sequence homology with the protease-activated receptor-2-like signature signaling peptide (11, 13). Both ZOT and zonulin are recognized by and their biological action on tjs blocked by polyclonal anti-ZOT Abs (6, 9), and both activate an intracellular signaling pathway that involves protein kinase C-mediated polymerization of intracellular actin filaments (which are directly connected to structural proteins of the tj) and thereby regulate intestinal epithelial permeability (14). The complex actin cytoskeletal network of the enterocyte is known to be involved in the intracellular trafficking of molecules (15),as well as in the regulation of paracellular permeability, by its direct interaction with the tj structural proteins (16). Our recent studies indicate that gliadin activates the zonulin signaling pathway in both normal and CD-derived intestinal mucosa in vitro (17, 18). The effect of gliadin on intercellular tj and barrier function using normal intestinal epithelial cells has been confirmed recently by other investigators (19). In the studies presented herein, we demonstrate that the effects of gliadin extend to macrophages, a cell type that is central to the innate immune response and present in the lamina propria beneath the intestinal mucosa. Gliadin activation of macrophages in vitro was found to up-regulate expression of a panel of inflammatory genes and result in the secretion of inflammatory cytokines. Moreover, both gliadin-induced intestinal zonulin release and the subsequent increase in intestinal permeability, as well as the release of zonulin and cytokines by gliadin-stimulated macrophages, were dependent upon myeloid differentiation factor 88 (MyD88), a key adapter in the TLR/IL-1R signaling pathways, but not on TLR2 or TLR4. These data suggest that gliadin-induced inflammatory responses are, in part, mediated by a combination of MyD88-dependent effects on intestinal permeability and macrophage-derived inflammatory mediators. A TLR-like signaling pathway would be predicted to serve as a bridge between the innate and adaptive response to gliadin that is associated with patients with CD. Protein-free (<0.008%) LPS was prepared from Escherichia coli K235 by phenol-water extraction (20). Gliadin was prepared by enzymatic digestion as described previously (21) with minor modifications. Briefly, 50 g of gliadin (crude wheat; Sigma-Aldrich) was dissolved in 500 ml of 0.2 N HCl for 2 h at 37°C with 1 g of pepsin (Sigma-Aldrich). The resultant peptic digest was further digested by the addition of 1 g of trypsin (Sigma-Aldrich) after the pH was adjusted to 7.4 using 2 M NaOH. The solution was stirred vigorously at 37°C for 4 h, boiled (100°C) for 30 min, freeze-dried, lyophilized in 10-mg aliquots, and stored at −20°C until use (referred to as pepsin/trypsin-digested gliadin or (PT)-gliadin). Gliadin synthetic peptides, 33-mer (22) and p31-43 (23), were synthesized at the Biopolymer Core Laboratory at the University of Maryland, Baltimore, MD. Measurement of the contaminating endotoxin in the gliadin preparation by Limulus amebocyte assay revealed 0.3–0.6 ng/ml endotoxin at the highest concentration of PT-gliadin tested (1 mg/ml), which is below the concentration necessary for the induction of optimal gene or cytokine expression in C57BL/6 macrophages (24). The TLR2 agonist, synthetic lipoprotein S-[2,3-bis(palmitoyloxy)-(2-RS)-propyl]-N-palmitoyl-(R)-Cys-(S)-Ser-Lys4-OH, trihydrochloride (Pam3Cys), was purchased from EMC Microcollections. The TLR3 agonist, polyinosinic-polycytidylic acid (poly(I:C)), was purchased from Amersham Biosciences. Human rIL-1β was purchased from R&D Systems, and human rTNF-α was obtained from Calbiochem. The biologically active fragment of V. cholera ZOT, ΔG, was prepared as described elsewhere (9). Cycloheximide (CHX) was purchased from Sigma-Aldrich. C57BL/6J, C3H/OuJ, and LPS-hyporesponsive C3H/HeJ mice were purchased from The Jackson Laboratory. Mice with a targeted mutation in TLR4 (TLR4−/− or “TLR4 knockout”) that were backcrossed onto a C57BL/6 background (>N8), as well as MyD88 (MyD88−/− or “MyD88 knockout”) mice, were provided by Dr. S. Akira (Osaka University, Osaka, Japan) (25, 26). The MyD88−/− mice were originally derived on a mixed C57BL/6 and 129 background, and for initial experiments involving gliadin effects on intestinal permeability we used mice that were backcrossed 2–4 generations onto a C57BL/6 background. For these studies, C57BL/6 × 129Sv F1 mice (The Jackson Laboratory) were used as MyD88+/+ controls. For all subsequent experiments, we used mice that were more extensively backcrossed onto a C57BL/6 background (≥N8), and C57BL/6J mice were used as wild-type (WT) controls for these experiments. All experiments were conducted with institutional approval. Peritoneal exudate macrophages were obtained by lavage 4 days after i.p. injection of 3 ml of sterile 3% thioglycolate broth. Cells were washed and resuspended in RPMI 1640 containing 2% FCS and standard supplements (27). Macrophages were plated in 24-well tissue culture dishes (2 × 106 cells/well) for supernatant collection or in 6-well tissue culture dishes (4 × 106 cells/well) for RNA extraction. After overnight incubation to allow for adherence of macrophages, monolayers were washed to remove nonadherent cells and incubated with medium, LPS, or PT-gliadin in a final volume of 2 ml. Supernatants were harvested 24 h after treatment and stored at −70°C. Cells were harvested 3 h after treatment and stored at −70°C. Murine IL-12 p40 and TNF-α were detected in macrophage culture supernatants using the Ab pairs and standards provided in the Quantikine M ELISA kit (R&D Systems). Zonulin was measured by ELISA in supernatants derived from macrophage cultures and microsnapwell intestinal cultures as described previously (28). Total RNA was isolated from macrophage cultures, and RT-PCR was performed as described previously (29). All primer and probe combinations have been published previously (29, 30, 31, 32, 33, 34, 35, 36, 37). The number of cycles used for amplification of each gene product was as follows: GAPDH, 21; TNF-α, 27; IL-12 p35, 32; IL-12 p40, 27; IL-15, 26; IL-6, 30; IFN-β, 33; inducible NO synthase (iNOS), 30; MCP-5, 34; TLR-2, 19; and TLR-4, 29. Amplified products were electrophoresed and transferred to Hybond N+ membranes (Amersham Biosciences) in 10× SSC by standard Southern blotting techniques. DNA was cross-linked by exposure to UV light, baked onto the nylon membrane, and hybridized with an internal oligonucleotide probe. Labeling of the probe and subsequent detection of bound probe was conducted using an ECL system (Amersham Biosciences). For select genes, mRNA expression was also quantified by real time PCR using SYBR Green PCR master mix (Applied Biosystems) and ABI PRISM 7900HT cycler. Primers for detection of TNF-α, IL-12 p35 and p40, IL-15, iNOS, IP-10, and hypoxanthine phosphoribosyltransferase (HPRT) mRNAs were designed using the Primer Express 2.0 program (Applied Biosystems). Relative gene expression was calculated using the comparative threshold cycle (ΔΔCt) method with HPRT as a housekeeping gene and the expression 2^[(CtHPRT −CtGene)stimulated − (CtHPRT − CtGene)medium] as described elsewhere (38). The microsnapwell system is a miniaturized version of the standard Ussing chamber that has been engineered to measure the transepithelial electrical resistance (TEER) of small intestinal fragments exposed to various stimuli as described previously (28). A decrease in TEER is the electrical signal that reflects increased intestinal permeability. Briefly, segments of mouse small intestine, unstripped or stripped of both muscle and serosal layers, were mounted onto the modified microsnapwell system (28). Two hundred microliters of DMEM containing 4.5 g/L glucose, 4 mM l-glutamine, 50 U/ml penicillin, 50 μg/ml streptomycin, and MEM with 1 mM nonessential amino acids (Invitrogen) was added to the mucosal (apical) side. Three milliliters of the same medium was added to the serosal (basolateral) side. The system was incubated at 37°C in an atmosphere of 95% air and 5% CO2 for 30 min to stabilize the pH. Intestinal segments were incubated for several incubation times with either 1 mg/ml PT-gliadin or PBS medium control added to the mucosal aspect of the tissue and TEER-monitored as described previously (28). To determine whether PT-gliadin effects were mediated via TLR4 or TLR2, Chinese hamster ovary (CHO) reporter cell lines that respond to specific TLRs were engineered as described previously (39). Briefly, plasmids containing the human Tac Ag (CD25) cDNA under transcriptional control of the human E selectin (NF-κB-driven) promoter and the CD14 cDNA were cotransfected into CHO-K1 cells to obtain the “3E10” cell line (40). In this study, we also used the 3E10 cell line that expresses endogenous hamster TLR4 responds to TLR4 agonists, but not to TLR2 agonists. The “3E10-huTLR2” cell line also expresses human TLR2 and, thus, responds to both TLR4 and TLR2 agonists (41, 42). Cells were plated in 12-well tissue culture plates at a density of 5 × 105 cells/well and incubated overnight at 37°C in a 5% CO2 atmosphere. Thereafter, cells were placed in fresh medium and treated for 18 h with medium, PT-gliadin, or LPS, detached from the plastic with trypsin/EDTA, and examined by flow cytometric analysis for the presence of surface CD25 as described (35). Briefly, following treatment the 3E10 and 3E10/TLR2 cell lines were stained with an anti-CD25 mAb (BD Biosciences Immunocytometry Systems). Samples were run in an Epics Elite ESP flow cytometer/cell sorter system (Beckman Coulter) and analyzed using the WinList flow cytometry software analysis package (Verity Software House). Flow cytometric studies were performed at the Center for Vaccine Development Flow Cytometry Core Facility Laboratory (University of Maryland, Baltimore, MD). It has been reported previously that PT-gliadin induces a zonulin-dependent increase in intestinal permeability that is reflected by a decrement in TEER (17). 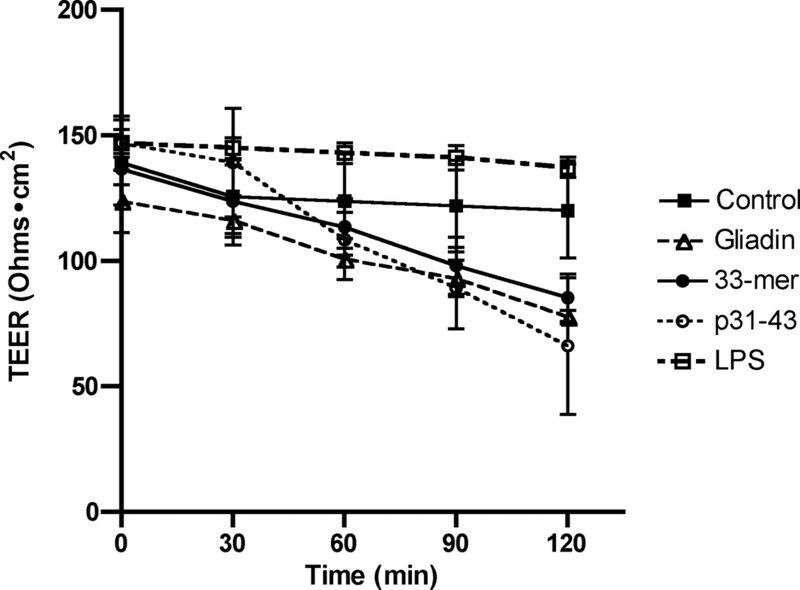 The addition of PT-gliadin to C57BL/6J intestinal mucosa mounted in the microsnapwell system (28) led to a reduction in TEER (which is inversely related to an increase in intestinal permeability) that became significant after 90 min of incubation (Fig. 1⇓). A similar effect was observed with the gliadin-derived synthetic peptides, 33-mer and p31-43, whereas no changes were detected in LPS-treated tissues (Fig. 1⇓; p < 0.05). The effect of 33-mer and p31-43 on TEER was related to zonulin release (data not shown) and was specific, because other gliadin-derived synthetic peptides failed to induce TEER changes (17). The PT-gliadin-permeating effect was reversible, with tissue TEER returning to baseline within 30 min of removal of the stimulus from the mucosal bathing solution (data not shown). Thus, PT-gliadin and its peptides, but not LPS, mediate increased intestinal permeability. PT-gliadin and its peptides, 33-mer and p31-43, induce intestinal permeability. Intestines from individual mice were treated with medium only, PT-gliadin (1000 μg/ml), or its peptide subunits p31-43 (100 μg/ml) and 33-mer (3.3 μg/ml) in the microsnapwell assay as described in Materials and Methods. Resistance (TEER) was measured over the indicated times. As an additional control, LPS (100 ng/ml) was tested and induced no significant TEER changes. Results represent the mean ± SEM from four mice per treatment. To determine the relative contribution of the intestinal epithelial cells vs the submucosa to the gliadin-induced decrease in resistance, similar experiments were conducted using intact intestinal segments (baseline TEER: 125 ± 27.7 ohms · cm2) or intestinal segments that had been stripped of the submucosa (i.e., muscle and serosal layers) (baseline TEER: 86 ± 13.6 ohms · cm2). Gliadin induced a change in TEER of 52 ohms · cm2 and 22 ohms · cm2 in unstripped vs stripped tissues, respectively (p < 0.05). These data suggest either that some of the preformed zonulin was removed with the stripping (i.e., that cells within the stripped layers contribute to the release of zonulin) or that removal of muscle and serosal layers leads to destruction of the neuroendocrine network that is required for zonulin release. Previous studies have suggested the possibility that gliadin, the immunologically active component of wheat gluten associated with CD (2), has the capacity to activate cytokine production in monocytes and macrophages (43, 44, 45). To confirm and extend these findings, the expression of a panel of proinflammatory genes known to be up-regulated by LPS was measured in murine peritoneal macrophages treated with concentrations of PT-gliadin or peptides derived from gliadin (p31-43 or 33-mer) that have been reported previously to be either immunomodulatory or cytotoxic (43, 44, 45). Initially, we used concentrations of PT-gliadin and peptides that were found to induce comparable changes in TEER (Fig. 1⇑) and compared their abilities with LPS to stimulate macrophage gene expression by semiquantitative RT-PCR with Southern analysis to detect changes in steady-state mRNA in a panel of proinflammatory cytokines (including TNF-α, IL-12, p35 and p40, IL-15, IL-6, IFN-β, iNOS, IP-10, and MCP-5). Fig. 2⇓A illustrates the observation that PT-gliadin is also a potent inducer of inflammatory gene expression, resulting in the induction of a spectrum of genes that is qualitatively similar to that induced by bacterial LPS, one of the most potent inflammatory agents. Previous studies suggesting comparable potency of PT-gliadin and LPS in stimulating macrophage cytokine production have been reported (46). Although less potent than LPS or PT-gliadin, the p31-43 and the 33-mer peptides were also capable of inducing the expression of genes that encode cytokines (e.g., TNF-α, IL-12 p35, IL-12 p40, IL-6, and IFN-β) and the chemokines IP-10 and MCP-5, but they failed to elicit iNOS mRNA and elicited barely detectable increased levels of IL-15. We also explored the possibility that PT-gliadin or its peptides might modulate the expression of TLR mRNA in macrophages. Consistent with our previous studies of the LPS effects on TLR2 gene expression (37), PT-gliadin and, to a lesser extent, p31-43 resulted in an up-regulation of TLR2 mRNA, whereas levels of steady-state mRNA levels for TLR4 were slightly down-regulated by LPS and PT-gliadin but not by either peptide. These data support the hypothesis that PT-gliadin and its active peptides are capable of increasing the expression of a repertoire of inflammatory genes that is similar to that induced by the prototype inflammatory stimulus, Gram-negative bacterial LPS. Moreover, the data indicate that PT-gliadin elicits a more potent inflammatory response than two of its bioactive peptides, suggesting the involvement of additional PT-gliadin-derived peptides in the inflammatory process. PT-gliadin and its peptide derivatives, p31-43 and 33-mer, induce proinflammatory gene expression in murine macrophages. A, Primary macrophage cultures from C57BL/6 mice were treated for 3 h with medium only, LPS (100 ng/ml), PT-gliadin (1000 μg/ml), p31-43 (100 μg/ml), or 33-mer (3.3 μg/ml). Total RNA was extracted and analyzed by RT-PCR with Southern blotting as described in Materials and Methods. B, The same RNA samples in A were also subjected to quantitative real-time PCR as described in Materials and Methods. Induction of all genes by LPS and PT-gliadin were found to be statistically greater than that of medium-treated macrophages. ∗, p < 0.05, as compared with LPS treatment. These data are representative of one of three independent experiments. The RT-PCR shown in Fig. 2⇑A was conducted at high cycle numbers to increase the sensitivity for detection of inflammatory mRNA species induced by PT-gliadin or the p31-43 and the 33-mer peptides by Southern analysis. However, under conditions of strong gene expression (e.g., TNF-α mRNA induced by LPS vs PT-gliadin) one cannot distinguish differences because the chemiluminescent reaction results in saturation of signal on the autoradiographic film in the Southern blot (see Fig. 2⇑A). Therefore, to assess differences between LPS and PT-gliadin for those genes that were very strongly induced, we subjected the same RNA preparations shown in Fig. 2⇑A to quantitative real-time PCR. Fig. 2⇑B illustrates the finding that LPS is ∼2.6-fold more potent than PT-gliadin for the induction of TNF-α and ∼6.2-fold more potent than PT-gliadin for the induction of IL-12 p40 mRNA. Nonetheless, PT-gliadin is indeed a potent inflammatory stimulus in that it induced 56- and 685-fold increases, respectively, in TNF-α and IL-12 p40 steady-state mRNA as compared with levels expressed in medium-treated cells. In contrast, LPS and PT-gliadin induced IL-12 p35, iNOS, and IP-10 mRNA levels were not statistically different when measured by real-time PCR. Because the signal for IL-15 mRNA was very faint in the Southern blot shown in Fig. 2⇑A, we also quantified induction of this cytokine gene by real-time PCR and found that both LPS and PT-gliadin induce IL-15 mRNA comparably, ∼7-fold over baseline levels. Taken together, these data strengthen the hypothesis that PT-gliadin induces the expression of a broad repertoire of inflammatory genes in macrophages. Table I⇓ illustrates the levels of secretion of two important proinflammatory cytokines, TNF-α and IL-12 p40, in macrophages treated with various concentrations of PT-gliadin as compared with LPS. In both cases LPS was a more potent inducer of cytokine secretion than PT-gliadin, which is consistent with differences detected at the level of steady-state mRNA expression by quantitative real-time PCR (Fig. 2⇑B). PT-gliadin-induced secretion of both TNF-α and IL-12 p40 was dose-dependent. In the same supernatants, we also measured levels of zonulin, whose effects on macrophage-mediated Ag uptake and presentation has been recently reported (47). Fig. 3⇓ illustrates the finding that PT-gliadin also elicits zonulin release by macrophages, whereas LPS does not. Similar levels of zonulin were also observed in macrophages challenged with either 33-mer (2.18 ± 0.49 ng/mg protein) or p31-43 (2.76 ± 0.77 ng/mg protein). 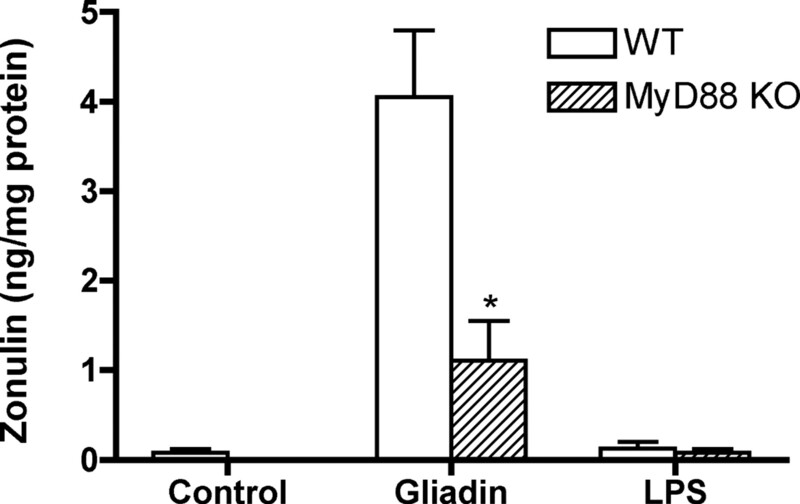 Gliadin, but not LPS, induces zonulin release in murine macrophages. C57BL/6 macrophage cultures were treated for 24 h with medium only, PT-gliadin (10–1000 μg/ml), or LPS (100 ng/ml) as described in the footnotes of Table I⇓. Results represent the mean ± SEM of a single representative experiment. ∗, p < 0.01. Signal transduction by TLRs and the IL-1 and IL-18 receptors is dependent upon agonist-induced receptor oligomerization and recruitment of adapter molecules to the “Toll/IL-1 resistance” domain within the intracytoplasmic region of the receptor (reviewed in48). Once associated with the receptor complex, these adapters create a platform on which downstream kinases can dock and initiate a cascade of intracellular signaling events that lead ultimately to gene expression. The induction of cytokine gene expression by LPS is dependent on the activation of TLR4, a type I transmembrane receptor, that cooperates with coreceptors within an “LPS signaling complex.” TLR4, like most of the TLRs and the IL-1/18 receptors, recruits a key adapter molecule called MyD88. To assess a potential role for MyD88 in gliadin-induced cytokine secretion and zonulin release, macrophages derived from WT mice and mice with a targeted mutation in the gene that encodes MyD88 (MyD88−/−) were treated with medium only, PT-gliadin, or LPS. Table II⇓ shows that secretion of TNF-α and IL-12 p40 was induced by both PT-gliadin and LPS in WT macrophages, and, as observed in Table I⇑, LPS was a more potent agonist than PT-gliadin. In contrast, MyD88-deficient macrophages exhibited a much reduced capacity to secrete cytokines in response to either agonist. Fig. 4⇓ shows that WT macrophages responded to PT-gliadin, but not LPS, to release zonulin, MyD88-deficient macrophage cultures were poorly responsive to PT-gliadin stimulation. Thus, the response to PT-gliadin in macrophages is MyD88-dependent. 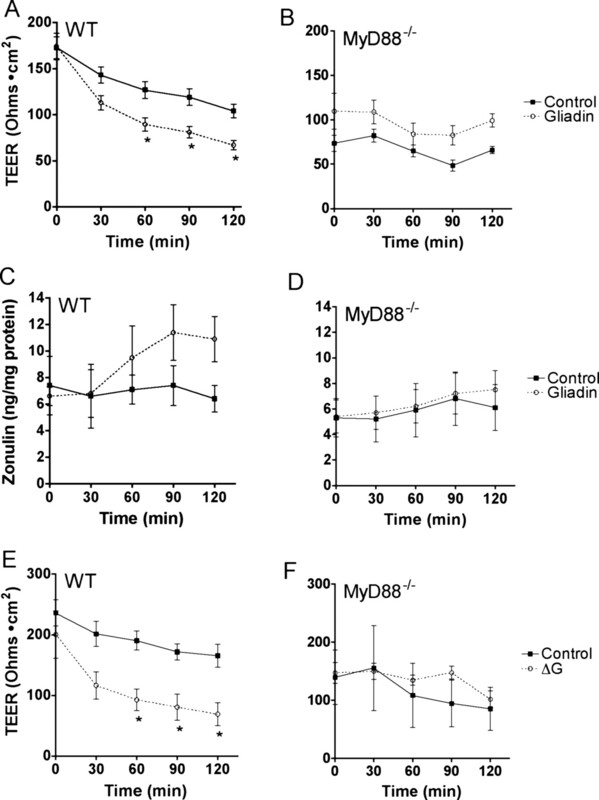 Gliadin-induced zonulin release in macrophages is MyD88-dependent. Primary macrophages from C57BL/6 (WT) and MyD88−/− (KO, knockout) mice were cultured for 24 h in the presence of medium only, LPS (50 ng/ml), or PT-gliadin (1000 μg/ml). Culture supernatants were collected and assayed for zonulin by ELISA. Results represent mean ± SEM from two separate experiments. ∗, p < 0.01. Based on the results obtained in macrophages, we sought to establish whether intestinal zonulin release and the subsequent TEER changes were also MyD88 dependent. Small intestinal tissues obtained from either WT mice or MyD88 knockout mice were mounted in the microsnapwell system and exposed to either PT-gliadin or buffer control, and zonulin release and TEER changes were monitored. As shown in Fig. 5⇓, the addition of PT-gliadin induced a significant TEER decrement in intestinal fragments from WT mice when compared with untreated controls (Fig. 5⇓A) that coincided temporarily with zonulin release in the medium (Fig. 5⇓C). Conversely, no significant changes in either TEER (Fig. 5⇓B) or zonulin release (Fig. 5⇓D) were detected in PT-gliadin-stimulated intestinal fragments from MyD88−/− mice, suggesting that the zonulin release and the subsequent intestinal permeability changes are also MyD88-dependent. Although baseline levels of TEER in MyD88−/− intestinal fragments were found to be significantly less than that of WT intestinal fragments (165 ± 12.7 vs 87 ± 12.9; p < 0.001), both responded to TNF-α with a significant decrement in TEER (ΔTEER for WT and MyD88−/− equaled 93 ± 10.7 and 24 ± 3.2, respectively; p < 0.05). Gliadin-induction of intestinal permeability and zonulin release is MyD88 dependent. Intestinal permeability was measured in the microsnapwell assay in medium- or PT-gliadin (1000 μg/ml)-stimulated intestinal fragments from WT (MyD88+/+) (A) or knockout (MyD88−/−) (B) mice. Culture supernatants were collected from the mucosal side of these same microsnapwell intestinal cultures form WT (MyD88+/+) (C) and MyD88−/− (D) mice and assayed for zonulin release by ELISA. Also shown is the effect of the ZOT ΔG peptide (10 μg/ml) on the intestinal permeability of WT (MyD88+/+) (E) and MyD88−/− (F) mice. The results represent the mean ± SEM of five mice for A–D and three mice for E and F. ∗, p < 0.01. Because the increase in intestinal permeability in response to PT-gliadin is secondary to the release of zonulin, we used a zonulin mimetic, ΔG, a peptide derived from ZOT (9). Previous studies support the hypothesis that zonulin and ΔG act on the same receptor to induce increased intestinal permeability (6, 9). When intestinal fragments from WT mice were treated with ΔG, the decrement in TEER was observed only in the tissues derived from WT mice and not from MyD88−/− mice (Fig. 5⇑, E vs F). This data implies that, in addition to zonulin release, signaling through the zonulin/ZOT receptor is MyD88-dependent. The findings that PT-gliadin induces inflammatory gene expression and cytokine secretion in macrophages similarly to LPS and that the TEER decrement and zonulin release induced by PT-gliadin are MyD88 dependent strongly suggested the possibility that the effects of PT-gliadin might be mediated through one of the TLRs. CHO cells express an endogenous hamster TLR4 that enables responses to LPS, but, fortuitously, these cells carry a genetic defect in their endogenous TLR2 gene that precludes signaling unless transfected with a vector that expresses a normal TLR2 (40, 41, 42). In addition, MyD88 is used by both the TLR4 and TLR2 signaling pathways and leads to NF-κB translocation (25). We have previously used two genetically engineered CHO cell lines to distinguish between TLR2 and TLR4 signaling (39). The 3E10 cell line expresses endogenous hamster TLR4 and no functional TLR2. 3E10-huTLR2 is the 3E10 cell line that has been engineered to express human TLR2 and thus responds to both TLR4 and TLR2 agonists (40, 41, 42). In addition, both of these cell lines also carry an NF-κB-responsive reporter gene that drives expression of cell surface CD25 (Tac-1) in response to TLR4- or TLR2-mediated signaling (40, 41, 42). The data in Fig. 6⇓ and Table III⇓ show clearly that expression of human TLR4 or TLR2 is not sufficient to mediate signaling by PT-gliadin. 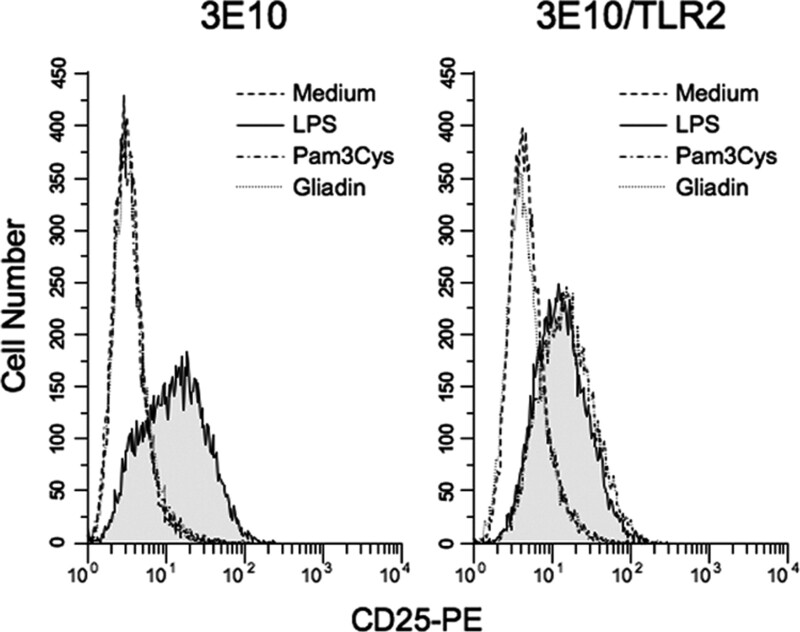 The 3E10 cell line responds to the TLR4 agonist, LPS, but not to the TLR2 agonist Pam3Cys or to PT-gliadin, as evidenced by an increase in cell surface CD25 expression. The 3E10-huTLR2 cell line responds to both TLR4 and TLR2 agonists, LPS and Pam3Cys, respectively, but not to PT-gliadin. These data reveal two important findings: 1) signaling by gliadin is not mediated by TLR4 or TLR2; and 2) signaling induced by PT-gliadin cannot be attributed to contaminating LPS. To strengthen our findings in CHO cells that TLR4 is not involved in PT-gliadin-induced signaling, we next compared TEER and zonulin release from PT-gliadin-stimulated intestinal mucosa from C3H/HeJ mice, a strain carrying a point mutation in the intracytoplasmic domain of TLR4 (P712H) that precludes LPS-induced signaling (49, 50). Intestinal permeability, as measured by the microsnapwell assay (Fig. 7⇓A), and zonulin release (Fig. 7⇓B) were induced normally by PT-gliadin in intestinal mucosa from C3H/HeJ mice. The PT-gliadin induced zonulin release by intestinal mucosa derived from C3H/HeJ mice was comparable to that elicited by PT-gliadin added to WT C3H/OuJ intestinal mucosa (Fig. 7⇓C). Thus, PT-gliadin does not mediate its effects on intestinal permeability through TLR4. Gliadin-induction of intestinal permeability (A) and zonulin release (B) are TLR4-independent. Intestinal permeability (A) and zonulin release at 60 min were measured in medium- or PT-gliadin (1000 μg/ml)-stimulated microsnapwell cultures derived from TLR4-defective C3H/HeJ mice (B) and TLR4-responsive C3H/OuJ mice (C) as described in the Fig. 5⇑ legend. The results represent the mean ± SEM from five mice per strain. ∗, p < 0.01. In additional experiments using TLR4+/+ and TLR4−/− mice backcrossed onto C57BL/6 mice, baseline levels of TEER were found not to be statistically different (176.7 ± 26.5 vs 150.3 ± 20.1 ohms · cm2; p = 0.43). Thus, the observed differences measured in MyD88+/+ and MyD88−/− (Fig. 5⇑) cannot be attributed to signaling through TLR4. Because the action of PT-gliadin was TLR2 and TLR4 independent, we additionally tested the capacity of other TLR agonists to induce zonulin release. Table IV⇓ illustrates the observation that the TLR3 agonist, poly(I:C), failed to induce zonulin release, although it did induce TNF-α secretion by macrophages. This is not surprising, because TLR3 has been found to be MyD88-independent (48). In contrast, the TLR2 agonist, Pam3Cys, induced both TNF-α and zonulin. Conversely, rIL-1β induced zonulin release, but not TNF-α. These data suggest that other TLR and related agonists may contribute to the release of zonulin and the increase in gut permeability. The mechanism(s) by which CD is initiated has been an enigma for many years. Although gliadin is now well-recognized as the antigenic trigger of this severe inflammatory response, the mechanisms by which gliadin gains access to the subepithelial compartment so that it may interact with APCs in the GALT, as well as the events that follow, remain elusive. Although recent work has delineated an association of gliadin peptides with certain histocompatibility Ags, HLA DQA1*0501/DQB1*0201 (51), on the surface of APCs, it has been suggested more recently that the pathogenesis of CD may be initiated as the consequence of the interaction between the innate and adaptive immune responses, such that a Th1 cytokine milieu is established in the GALT upon gliadin exposure (23). CD patients and a subgroup of their relatives have been reported to exhibit increased intestinal permeability (52). The increased permeability, which occurs within 36 h, seems to be a very early response to gluten exposure (53), suggesting that increased intestinal permeability is not the consequence of chronic intestinal damage and inflammation. Zonulin, a soluble factor that triggers increased intestinal permeability, is up-regulated in CD (7) and in type 1 diabetes (54). In an animal model of type 1 diabetes, the zonulin-mediated increase in intestinal permeability preceded the onset of the autoimmune process by 3–4 wk and was prevented by pretreatment with a zonulin inhibitor (55). Therefore, it is conceivable that a similar timeline might occur in CD. To date, the gene that encodes zonulin has not been cloned; however, based on recent proteomics data, zonulin appears to be biochemically and functionally similar to a known serine protease (A. Fasano, unpublished observation). Much progress has been made in identifying the biochemical characteristics of gliadin and understanding the activation of the immune system by gliadin and its immunomodulatory peptides. This progress includes recent studies that have implicated the NF-κB pathway as a mechanism of gliadin-induced activation in IFN-γ-stimulated mouse RAW 264.7 and human THP-1 and U-937 monocyte/macrophage cell lines (43, 44). It has also been documented that TNF-α and NO are produced upon gliadin activation of IFN-γ-stimulated resident peritoneal murine macrophages (45). 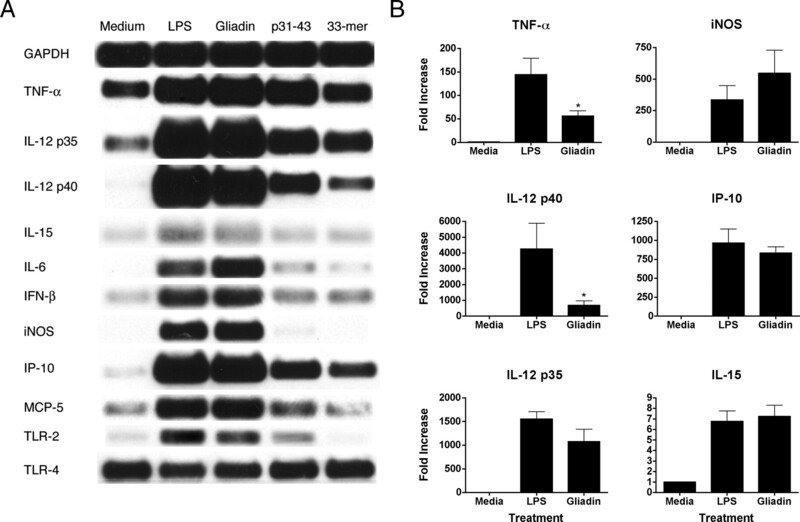 Our data show that PT-gliadin and its derivative peptides, 33-mer and p31-43, stimulate a broad spectrum of proinflammatory genes in primary murine macrophages, similar to that induced by the potent inflammatory agent LPS, with PT-gliadin inducing a broader array of proinflammatory genes than either peptide. In addition to the stimulation of proinflammatory genes such as TNF-α and IL-12, other important genes that could potentially exacerbate the local inflammatory response were up-regulated as well. These include TLR2, which enables responses to many Gram-positive bacterial moieties, and the chemokines IP-10 and MCP-5, which, in turn, recruit monocytes and T cells to the site of release. Ultimately, the inflammatory milieu is amplified by the activation of T cells locally, leading to the pathology associated with CD. Such a scenario could also account for the activation of NK cells that have been shown to participate in the atrophy of intestinal villi in CD patients (56, 57). At this juncture, the cellular receptor for gliadin has not been identified. Moreover, the possibility of LPS contamination in the gliadin preparation used in this study was of concern to us. Although very low LPS concentrations were detected by the Limulus assay in the PT-gliadin preparation used in this study, PT-gliadin failed to activate CHO cell lines that respond strongly to LPS or Pam3Cys, indicating that PT-gliadin-induced signaling is neither TLR4- nor TLR2-dependent. In addition, the finding of PT-gliadin-induced intestinal permeability and zonulin secretion in C3H/HeJ mice, a strain that has a point mutation in TLR4 that precludes LPS signaling, further supports our contention that gliadin-induced signaling is TLR4-independent. Lastly, PT-gliadin was also found to induce zonulin release in macrophages and to increased intestinal permeability in WT mice, whereas LPS did neither. Because the TLRs represent a family of evolutionarily conserved receptors that have evolved to detect microbial invasion, it remains possible that gliadin signals through one of the remaining nine known family members. Most of the TLRs initiate intracellular signaling by recruiting an adapter molecule called MyD88 (48). Although we were able to exclude both TLR4 and TLR2 as receptors for gliadin, PT-gliadin-induced cytokine expression, zonulin release, and its effects on intestinal permeability were all found to be MyD88-dependent. In both PT-gliadin- and LPS-stimulated MyD88−/− macrophages stimulated with PT-gliadin or LPS, IL-12 p40 was not induced, and TNF-α secretion was substantially lower when compared with the responses of WT macrophages. Zonulin production was also decreased in PT-gliadin-stimulated MyD88−/− macrophages, consistent with the observation that intestinal permeability and zonulin release remained unchanged in PT-gliadin-stimulated MyD88−/− intestinal cultures. By using the active ZOT peptide, ΔG, to obviate the need for zonulin release in this system, we were also able to show that signaling through the zonulin/ZOT receptor, and not just the release of zonulin by gliadin stimulation, is MyD88-dependent. To date, MyD88 has been shown to interact with most TLRs and the IL-1 and IL-18 receptors (48). The data presented in Table IV⇑ suggest that other MyD88-dependent signaling pathways (e.g., TLR2 and IL-1R) are capable of inducing zonulin release by macrophages, whereas TLR3 failed to do so. This finding is consistent with the observation that TLR3 signaling is MyD88-independent (48). It is also consistent with our observation that at 2 h following gliadin stimulation of macrophages, zonulin release was only partially inhibited by CHX, whereas TNF-α release was completely ablated (data not shown). This observation is consistent with the idea that a CHX-sensitive pool of zonulin is induced secondarily by gliadin-induced IL-1β. Recently, a role for TLRs in the maintenance of normal intestinal homeostasis, as well as in disease, has been demonstrated (reviewed in58). The importance of TLR signaling in protection against intestinal damage is illustrated by the oral administration of dextran sodium sulfate, which results in more profound intestinal damage in TLR4, TLR2, or MyD88 knockout mice than in normal mice (59, 60), indicating an important role for TLR signaling by commensal flora in the maintenance of intestinal homeostasis. In this study, we have provided evidence for a MyD88-dependent mechanism(s) by which gliadin, the component of wheat gluten that is central in CD pathogenesis, causes release of a cell-derived soluble product, zonulin, that acts on the gut epithelium to elicit a loss of epithelial tj integrity. This action is predicted to facilitate access of gliadin to submucosal macrophages that, in turn, are stimulated to release proinflammatory cytokines. This could well result in the type of chronic inflammatory state that is characteristic of CD patients and create a milieu that is conducive to the development of an autoimmune condition. Interestingly, our data also show that MyD88 knockout mice have intestines that are basally “leaky” as evidenced by a significantly lower level of baseline TEER measurements. This “leakiness” may well have contributed to recent observations that such mice are more sensitive to dextran sodium sulfate-induced colitis (59, 60); however, this was not found to be the case for TLR4-null mice, indicating that some additional mechanism must be invoked to explain their increased sensitivity to dextran sodium sulfate administration. Future studies will be required to elucidate the identity of the MyD88-mediated pathway through which gliadin is signaling. It also remains to be established whether zonulin expression is MyD88-dependent, because the gene that encodes this product has yet to be identified. At this time, zonulin appears to be similar, if not identical, to a known serine protease (A. Fasano, unpublished observation), although formal proof of this concept is ongoing. In summary, the findings in this report support a clear connection between the induction of the innate and adaptive immune responses to gliadin, the antigenic stimulus associated with CD. Although CD has been previously associated with the inheritance of specific HLA Ags that are critical to the adaptive immune response, our data in MyD88-null mice would suggest the possibility that individuals with mutations in MyD88 may exhibit a predisposition for gut leakiness that, in turn, render them more readily susceptible to gliadin-induced inflammation. We have found that PT-gliadin and its peptides are capable of inducing an increase in gut permeability and zonulin release in intestinal tissues and induction of proinflammatory gene expression, cytokine secretion, and zonulin release in macrophages. The physical proximity of macrophages to the submucosa suggests a critical role for these cells as key players in the innate and adaptive immune responses to gliadin. Because these studies were performed using murine macrophages, we cannot claim with confidence that our findings necessarily reflect mechanisms operative in CD pathogenesis. Nevertheless, our data generated by using intestinal biopsies obtained from CD patients (18), together with previous reports in the literature (23), seem to support a possible biological effect of gliadin on intestinal mucosa and GALT of CD patients. Based on these considerations, we propose the following model. Secondary to an increase in intestinal permeability as a consequence of gluten exposure and zonulin release within the intestinal lumen (as suggested by the polarized secretion of the peptide; see Fig. 7⇑, B and C), gliadin gains access to the submucosa and stimulates macrophages in an MyD88-dependent fashion to promote a Th1 cytokine milieu (e.g., TNF-α, IL-12 p70, IL-15, etc.) through up-regulation of proinflammatory gene expression and cytokine secretion. The release of chemokines such as IP-10 would attract additional monocytes and T lymphocytes into the submucosa and intraepithelial γδ T lymphocytes. Based on our observation that zonulin receptors are expressed in macrophages and that, when activated, the zonulin pathway affects Ag uptake and presentation (47), it is reasonable to hypothesize that zonulin contributes to the gliadin-induced inflammatory response. Moreover, if gliadin is recognized by an MyD88-associated “pattern recognition receptor,” it is likely that it would also up-regulate expression of costimulatory molecules on these same macrophages, which can then serve as APC for initiation of the adaptive T cell responses observed in CD patients. Ag (gliadin)-specific activation of T cell receptors following interaction with processed gliadin peptides on HLA Ags expressed by APCs would lead to the further induction of T cell-derived cytokines such as IFN-γ that act on macrophages to amplify the release of inflammatory mediators locally, causing an inflammatory reaction that is sustained until the inciting Ag is removed from the diet. In this fashion, the macrophage bridges the innate and adaptive immune responses to gliadin. We are deeply indebted to Dr. Mariarosaria Di Pierro and Sandro Drago for their valuable technical assistance and to Dr. Douglas Golenbock for generously providing CHO cell lines used in this study. A. Fasano and S.N. Vogel have a financial interest in Alpha Therapeutics. ↵1 This work was supported by National Institutes of Health Grants AI-18797 (to S.N.V.) and DK-48373 and DK-66630 (to A.F.). ↵3 Abbreviations used in this paper: CD, celiac disease; CHO, Chinese hamster ovary; CHX, cycloheximide; HPRT, hypoxanthine phosphoribosyltransferase; iNOS, inducible NO synthase; Pam3Cys, S-[2,3-bis(palmitoyloxy)-(2-RS)-propyl]-N-palmitoyl-(R)-Cys-(S)-Ser-Lys4-OH, trihydrochloride; PT-gliadin, pepsin/trypsin-digested gliadin; poly(I:C), polyinosinic-polycytidylic acid; TEER, transepithelial electrical resistance; tj, tight junction; WT, wild type; ZOT, zonula occludens toxin. Trier, J. S.. 1998. Diagnosis of celiac sprue. Gastroenterology 115: 211-216. Schuppan, D.. 2000. Current concepts of celiac disease pathogenesis. Gastroenterology 119: 234-242. Sollid, L. M., E. Thorsby. 1993. HLA susceptibility genes in celiac disease: genetic mapping and role in pathogenesis. Gastroenterology 105: 910-922. Madara, J. L., J. S. Trier. 1980. Structural abnormalities of jejunal epithelial cell membranes in celiac sprue. Lab. Invest. 43: 254-261. Wang, W., S. Uzzau, S. E. Goldblum, A. Fasano. 2000. Human zonulin, a potential modulator of intestinal tight junctions. J. Cell Sci. 113: 4435-4440. Fasano, A., T. Not, W. Wang, S. Uzzau, I. Berti, A. Tommasini, S.E. Goldblum. 2000. Zonulin, a newly discovered modulator of intestinal permeability, and its expression in coeliac disease. Lancet 358: 1518-1519. Ventura, A., G. Magazzu, L. Greco. 1999. Duration of exposure to gluten and risk for autoimmune disorders in celiac patients. Gastroenterology 117: 197-303. Di Pierro, M., R. Lu, S. Uzzau, W. Wang, K. Margaretten, C. Pazzani, F. Maimone, A. Fasano. 2001. Zonula occludens toxin structure-function analysis: identification of the fragment biologically active on tight junctions and of the zonulin receptor binding domain. J. Biol. Chem. 276: 19160-19165. Adams, D., E. Fang, S. N. Vogel, A. Fasano. 2004. Zonulin is structurally and functionally related to the mucosal mast cell-derived mast cell protease II. Gastroenterology 126: A520 (Abstr.). Thakar, M, S. Vogel, J. Kao, A. Fasano. 2005. The Vibrio cholerae-generated zonula occludens toxin (Zot) N-terminal cleavage site contains a protease-activated receptor activating peptide (PAR-AP) that retains biological activity on intestinal tight junctions. Gastreonterology 128: A541 (Abstr.). Lu, R., W. Wang, S. Uzzau, R. Vigorito, H. R. Zielke, A. Fasano. 2000. Affinity purification and partial characterization of the zonulin/zonula occludens toxin (Zot) receptor from human brain. J. Neurochem. 74: 320-326. Clemente, M. G., S. N. Vogel, M. Hollenberg, S. De Virgilis, A. Fasano. 2004. Involvement of the proteinase-activated receptor 2 (PAR-2) in the Zot/zonulin-mediated regulation of intestinal tight junctions. Gastroenterology 126: A519 (Abstr.). Fasano, A., C. Fiorentini, G. Donelli, S. Uzzau, J. B. Kaper, K. Margaretten, X. Ding, S. Guandalini, L. Comstock, S. E. Goldblum. 1995. Zonula occludens toxin (Zot) modulates tight junctions through protein kinase C-dependent actin reorganization, in vitro. J. Clin. Invest. 96: 710-720. Mays, R. W., K.A. Beck, W. J. Nelson. 1994. Organization and function of the cytoskeleton in polarized epithelial cell as component of the protein sorting machinery. Curr. Opin. Cell Biol. 6: 16-24. Wittchen, E. S., J. Haskins, B.R. Stevenson. 1999. Protein interactions at the tight junction: actin has multiple binding partners, and ZO-1 forms independent complexes with ZO-2 and ZO-3. J. Biol. Chem. 274: 35179-35185. Clemente, M. G., S. De Virgiliis, J. S. Kang, R. Macatagney, M. P. Musu, M. R. Di Pierro, S. Drago, M. Congia, A. Fasano. 2003. Early effects of gliadin on enterocyte intracellular signalling involved in intestinal barrier function. Gut 52: 218-223. Drago S., R. El Asmar, M. Di Pierro, M. G. Clemente, A. Sapone, M. Thakar, G. Iacono, A. Carroccio, C. D’Agate, T. Not, et al. Gliadin, zonulin, and gut permeability: effect on celiac and nonceliac intestinal mucosa and intestinal cell lines. Scand. J. Gastroenterol. In press. Sander, G. R., A. G. Cummins, T. Henshall, B. C. Powell. 2005. Rapid disruption of intestinal barrier function by gliadin involves altered expression of apical junctional proteins. FEBS Lett. 579: 4851-4855. McIntire, F. C., H. W. Sievert, G. H. Barlow, R. A. Finley, A. Y. Lee. 1967. Chemical, physical, biological properties of a lipopolysaccharide from Escherichia coli K-235. Biochemistry 6: 2363-2372. De Ritis, G., P. Occorsio, S. Auricchio, F. Gramenzi, G. Morisi, V. Silano. 1979. Toxicity of wheat flour proteins and protein-derived peptides for in vitro developing intestine from rat fetus. Pediatr. Res. 13: 1255-1261. Shan, L., O. Molberg, I. Parrot, F. Hausch, F. Filiz, G. M. Gray, L. M. Sollid, C. Khosla. 2002. Structural basis for gluten intolerance in celiac sprue. Science 297: 2275-2279. Maiuri, L., C. Ciacci, I. Ricciardelli, L. Vacca, V. Raia, S. Auricchio, J. Picard, M. Osman, S. Quarantino, M. Londei. 2003. Association between innate response to gliadin and activation of pathogenic T cells in celiac disease. Lancet 362: 30-37. Perera, P. Y., S. N. Vogel, G. R. Detore, A. Haziot, S. M. Goyert. 1997. CD14-dependent and CD14-independent signaling pathways in murine macrophages from normal and CD14 knockout mice stimulated with lipopolysaccharide or taxol. J. Immunol. 158: 4422-4429. Salkowski, C. A., S. N. Vogel. 1992. IFN-γ mediates increased glucocorticoid receptor expression in murine macrophages. J. Immunol. 148: 2770-2777. El Asmar, R., P. Panigrahi, P. Bamford, I. Berti, T. Not, G. V. Coppa, C. Catassi, A. Fasano. 2002. Host-dependent zonulin secretion causes the impairment of the small intestine barrier function after bacterial exposure. Gastroenterology 123: 1607-1615. Manthey, C. L., P. Y. Perera, C. A. Salkowski, S. N. Vogel. 1994. Taxol provides a second signal for murine macrophage tumoricidal activity. J. Immunol. 152: 825-831. Barber, S. A., M. J. Fultz, C. A. Salkowski, S. N. Vogel. 1995. Differential expression of interferon regulatory factor 1 (IRF-1), IRF- 2, and interferon consensus sequence binding protein genes in lipopolysaccharide (LPS)-responsive and LPS-hyporesponsive macrophages. Infect. Immun. 63: 601-608. Wynn, T. A., I. Eltoum, A. W. Cheever, F. A. Lewis, W. C. Gause, A. Sher. 1993. Analysis of cytokine mRNA expression during primary granuloma formation induced by eggs of Schistosoma mansoni. J. Immunol. 151: 1430-1440. Gazzinelli, R. T., I. Eltoum, T. A. Wynn, A. Sher. 1993. Acute cerebral toxoplasmosis is induced by in vivo neutralization of TNF-α and correlates with the down-regulated expression of inducible nitric oxide synthase and other markers of macrophage activation. J. Immunol. 151: 3672-3681. Sher, A., R. I. Coffman, S. Heiny, P. Scott, A. W. Chever. 1990. Interleukin 5 is required for the blood and tissue eosinophilia but not granuloma formation induced by infection with Schistosoma mansoni. Proc. Natl. Acad. Sci. USA 87: 61-65. Doherty, T. M., R. A. Seder, A. Sher. 1996. Induction and regulation of IL-15 expression in murine macrophages. J. Immunol. 156: 735-741. Svetic, A., F. D. Finkelman, Y. C. Jian, C. W. Dieffenbauch, D. E. Scott, K. F. McCarthy, A. D. Steinberg, W. C. Gause. 1991. Cytokine gene expression after in vivo primary immunization with goat antibody to mouse IgD antibody. J. Immunol. 147: 2391-2397. Salkowski, C. A., G. Detore, A. Franks, M. C. Falk, S. N. Vogel. 1998. Pulmonary and hepatic gene expression following cecal ligation and puncture: monophosphoryl lipid A prophylaxis attenuates sepsis-induced cytokine and chemokine expression and neutrophil infiltration. Infect. Immun. 66: 3569-3578. Livak, K. J., T. D. Schmittgen. 2001. Analysis of relative gene expression data using realtime quantitative PCR and the 2−ΔΔCT method. Methods 25: 402-408. Medvedev, A. E., P. Henneke, A. Schromm, E. Lien, R. Ingalls, M. J. Fenton, D. T. Golenbock, S. N. Vogel. 2001. Induction of tolerance to lipopolysaccharide and mycobacterial components of Chinese hamster ovary/CD14 cells is not affected by overexpression of Toll-like receptors 2 or 4. J. Immunol. 167: 2257-2267. DeLude, R., A. Yoshimura, R.R. Ingalls, D.T. Golenbock. 1998. Construction of a lipopolysaccharide reporter cell line and its use in identifying mutants defective in endotoxin, but not TNF-α, signal transduction. J. Immunol. 161: 3001-3009. Lien, E., T. J. Sellati, A. Yoshimura, T. H. Flo, G. Rawadi, R. W. Finberg, J. D. Carroll, T. Espevik, R. R. Ingalls, J. D. Radolf, D. T. Golenbock. 1999. Toll-like receptor 2 functions as a pattern recognition receptor for diverse bacterial products. J. Biol. Chem. 274: 33419-33425. Heine, H., C. J. Kirschning, E. Lien, B. G. Monks, M. Rothe, D. T. Golenbock. 1999. Cutting edge: cells that carry a null allele for Toll-like receptor 2 are capable of responding to endotoxin. J. Immunol. 162: 6971-6975. Maiuri, M. C., D. De Stefano, G. Mele, B. Iovine, M. A. Bevilacqua, L. Greco, S. Auricchio, R. Carnuccio. 2003. Gliadin increases iNOS gene expression in interferon-γ-stimulated RAW 264.7 cells through a mechanism involving NF-κB. Naunyn-Schmiedeberg’s Arch. Pharmacol. 368: 63-71. Jelinkova, L., L. Tuckova, J. Cinova, Z. Flegelova, and H. Tlaskalova-Hogenova H. 2004. Gliadin stimulates human monocytes to production of IL-8 and TNF-α through a mechanism involving NF-κB. FEBS Lett. 571: 81–85. Tuckova, L., Z. Flegelova, H. Tlaskalova-Hogenova, Z. Zidek. 2000. Activation of macrophages by food antigens: enhancing effect of gluten on nitric oxide and cytokine production. J. Leukocyte Biol. 67: 312-318. Nikulina, M., C. Habich, S. B. Flohe, F. W. Scott, H. Kolb. 2004. Wheat gluten causes dendritic cell maturation and chemokine secretion. J. Immunol. 173: 1925-1933. Fasano, A., M. Sztein, R. Lu, and M. Tanner. 2004. Method to use Zot to inhibit lymphocyte proliferation in an antigen-specific manner. Patent No. U.S. 6,733,562 B1. Vogel, S. N., K. A. Fitzgerald, M. J. Fenton. 2003. TLRs: differential adapter utilization by Toll-like receptors mediates TLR-specific patterns of gene expression. Mol. Interv. 3: 466-477. Poltorak, A., X. He, I. Smirnova, M.Y. Liu, C. Van Huffel, X. Du, D. Birdwell, E. Alejos, M. Silva, C. Galanos, et al. Science 282: 2085–2088. Kim, C. Y., H. Quarsten, E. Berseng, C. Khosla, L. M. Sollid. 2004. Structural basis for HLA-DQ2-mediated presentation of gluten epitopes in celiac disease. Proc. Natl. Acad. Sci. USA 101: 4175-4179. Fasano, A.. 2001. Pathological and therapeutical implications of macromolecules passage through the tight junction. M. Cereijido, and J. Anderson, eds. Tight Junctions 697-722. CRC Press, Boca Raton, FL. Di Cagno, R., M. De Angelis, S. Auricchio, L. Greco, C. Clarke, M. De Vincenzi, C. Giovannini, M. D’Archivio, F. Landolfo, G. Parrilli, et al 2004. Sourdough bread made from wheat and nontoxic flours and started with selected lactobacilli is tolerated in celiac sprue patients. Appl. Environ. Microbiol. 70: 1088-1096. Counts, D.R., M.G. Clemente, A. Fasano. 2002. The gut protein zonulin is increased in patients with type 1 diabetes and their first degree relatives. Pediatr. Res. 51: 123A (Abstr.). Watts, T., I. Berti, A. Sapone, T. Gerarduzzi, T. Not, R. Zielke, A. Fasano. 2005. Role of the intestinal tight junction modulator zonulin in the pathogenesis of type-I diabetes in BB diabetic prone rats. Proc. Natl. Acad. Sci. USA 102: 2916-2921. Meresse, B., Z. Chen, C. Ciszewski, M. Tretiakova, G. Bhagat, T.N. Krausz, D.H. Raulet, L.L. Lanier, V. Groh, T. Spies, et al 2004. Coordinated induction by IL15 of a TCR-independent NKG2D signaling pathway converts CTL into lymphokine-activated killer cells in celiac disease. Immunity 21: 357-366. Hue, S., J. J. Mention, R.C. Monteiro, S. Zhang, C. Cellier, J. Schmitz, V. Verkarre, N. Fodil, S. Bahram, N. Cerf-Bensussan, S. Caillat-Zucman. 2004. A direct role for NKG2D/MICA interaction in villous atrophy during celiac disease. Immunity 21: 367-377. Rakoff-Nahoum, S., J. Paglino, F. Eslami-Varzaneh, S. Edberg, R. Medzhitov. 2004. Cell 118: 229-224.